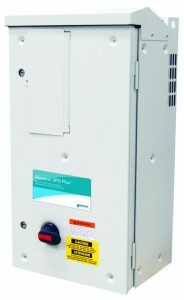 Aquavar SPD Plus is a variable speed pump controller that allows easy installation with factory installed start-up assistant software, which simplifies the installation process. It is designed to work directly with centrifugal and submersible pumps with ease. SPD Plus has the true motor match feature which allows a 100 HP SPD Plus to run a 100 HP pump efficiently. Goulds Water Technology is an industry leader offering pumps and pump controllers with advanced technology, proven reliability, and full service on a complete line of products.